Joe Straus: Supports New Taxes & Obamacare, Opposes Gun Rights, Pro Abortion, Betrayed Republicans – Texas MUST Elect a New Speaker! Please forward this to all conservative Republicans in Texas. We must Stand up for conservative values and Joe Straus MUST be defeated. 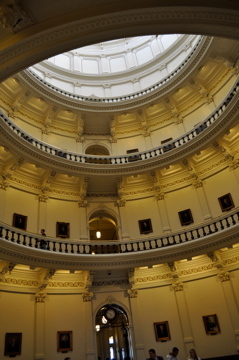 The Texas Speaker Election is tomorrow, Jan 8th, 2013. Contact your State Representative and tell them you do not support Joe Straus! This really should be national news because of how shocking it is. The conservative Republican running against Joe Straus is David Simpson. Breaking News: The Republicans hold the majority in the United States House of Representatives, but in a shock move, a few Republicans teamed up with all the Democrats which has given the Democrats the majority to be able to select Nancy Pelosi as the leader of the majority Republican US House. Just kidding, that did not happen and probably would not ever happen. If that ever happened then there would be uncontrollable outrage from Republicans. This DID HAPPEN IN TEXAS though. Back in 2009, a few Texas Republican traitors teamed up with the Democrats to elect the Speaker of the Republican Majority House. Texas Republicans had a slim majority in the Texas House of Representatives. The Republicans of the House had the majority to be able to vote as a Republican body to decide which Republican would become speaker. Instead, the power to select the Speaker was given to the Democrats. How? A handful of moderate Republicans in the Texas House teamed up with ALL of the Democrats in the Texas House. This gave the Democrats the power to select someone who was moderate and much less conservative that the current Republican Speaker of the Texas House. The Democrats and the handful of Republican picked wealthy moderate Joe Straus as the Speaker. This is a complete act of betrayal. Republicans should consider these State Reps as traitors for turning their backs on their Republican Party and not allowing the Texas Republicans (who had the majority) to pick the Speaker of the Texas House. If I did not know anything about Joe Straus I would still NEVER support him simply because of the fact that he was a traitor to the Republican Party and sold himself to the Democrats to allow the Democrats to pick a new Speaker instead of the Republicans. Without knowing anything about Joe Straus, I already know that he cannot be trusted because he has already teamed up with Democrats before. I also already know that he cannot be very conservative because the Democrats would have never gone along with this to team up with the handful of Republicans unless they were guaranteed that the new speaker was going to be considerably less conservative than the current one. After knowing everything I just told you above, if you still believe Joe Straus when he lies and says he is a Conservative Republican then you simply just do not understand what it means to team up with Democrats to select a new speaker because the current one was too conservative. Maybe you will understand that Joe Straus is not conservative if you knew a little bit more about Joe Straus. Click here for the History of Joe Straus (Voting History, Support for Abortion, Killing conservative bills, Selecting Liberals for Committees Chairmen, Supporting Tax Increases, Campaigning for Democrats over Republicans, etc). Wait though, Joe Straus will say that there are more Republicans in the Texas House of Representatives now than before he became speaker of the House: Yes that is true, but that has nothing to do with Joe Straus. Joe Straus snuck into office of the Speaker in 2009 when Republicans everywhere were down and Obama even just won the Presidency. Obama winning woke up America and the 2010 election saw a Republican Wave all over America. The Republican wave was especially big in Texas because, In addition to Obama getting elected causing Republicans to get out and vote, Texas also had a large number of conservative Representatives who got elected out of outrage that moderate Joe Straus was elected to Speaker. These conservative Representatives were sent to Austin to oppose Joe Straus and they did. Unfortunately, Joe Straus had the power of the Speaker and was able to keep power by threatening anyone who opposed him with bad committee placement and getting hurt in redistricting. He also of course still had the backing of all the democrats and did not have a person stand up to oppose him for Speaker until last minute. Wait though, Joe Straus will say that there were many conservative bills passed in the 2011 Legislature, including a pro-life sonogram bill. How can Joe Straus not be conservative if there were conservative bills allowed to be passed in 2011? : This is true that there were conservative bills passed in 2011, including a sonogram bill. This conservative legislation in the 2011 Texas Legislative Session passed, not because of him, but in spite of him. Joe Straus is not stupid and there was a super majority of Republican in the Texas House. He is a slick politician who wants to keep power. He knows he could not openly oppose some of the major conservative bills supported by the majority of the House so he did not stand in the way of the bills. For instance, Straus, even though he is not pro-life and supports Roe V Wade, did not stand against the pro-life bills because he knew the pro-life bills would pass anyways with a super-majority of Republicans in the Texas Legislature. What is more telling though is that he also did not stand for them or promote them. Given different circumstances, like less Republicans in the House, I believe Straus would stop playing to the super-majority and play both sides because he will need the Democrats in a split house. What Straus will also not tell you though is that, even though there were some conservative bills passed in 2011, there were many more super conservative bills that were killed by in Joe Straus’s Committee’s and even some bills killed by Joe Straus himself. Joe Straus has REFUSED to pledge his support for the right to keep and bear arms. He has fought efforts to restore your God-given right to keep and bear arms every step of the way. "Guns on campus, guns somewhere else? Are we really fixing problems or do we just think we do? In Texas, you expect the leaders to oppose Obamacare and oppose tax increases. No state leader in Texas even has to think about whether or not to oppose Obamacare and new taxes. Why? Because this is Texas and we are a pretty conservative state and if you do no oppose Obamacare and oppose new taxes then you might as well resign because you will not get elected again to a statewide office in this state. All of the Texas leaders are very vocal about their opposition to Obamacare and are opposed to new taxes instead of spending cuts. Wait, how is that possible that Joe Straus is a state-wide leader and is not strongly opposed to Obamacare and tax increases? How was he ever elected to that position? The reason Joe Straus is the Speaker of the House in Texas is because the people of Texas do not vote to make him Speaker. If the people of Texas voted for speaker in a state-wide vote then Joe Straus would never be elected to lead this conservative state. The only reason he ever got elected to be Speaker is because he was a traitor to the Republican Party. Joe Straus was elected speaker by teaming up with the DEMOCRATS in the House. He got all the Democrats in the House to vote for him. Straus also has money and has wielded his money and power as Speaker to threaten and hurt people who oppose him as Speaker. This is not a man who should be leading our conservative state. The Republican State Representatives in the Texas House need to stand up and elect a better, more conservative person to lead the Republican majority Texas House of Representatives. How can a conservative Republicans in Texas go along with a traitor like Straus after knowing the liberal history of Joe Straus? Click here to view Joe Straus' voting record.